MY RETURN TO ROBIN HOOD COUNTRY (1999) - My second trip to England co-incided with the second academic conference devoted to Robin Hood studies -- the one with the controversy that Robin Hood might be gay. Not only did I tour Nottingham and Sherwood again, I also visited Robin Hood's grave in Kirklees. MY FURTHER ADVENTURES IN ROBIN HOOD COUNTRY (2003) - This visit was based around the fourth Robin Hood academic conference based in York - including trips to Fountains Abbey (reputed home of Friar Tuck) and Barnsdale (Robin's home in several ballads). And yes, I visited Nottingham and Sherwood too. WHY I LIKE ROBIN HOOD - A brief look at the appeal of the legend. There are many histories of Robin Hood. There's the fictional history of the character -- unqiue (in theory, anyway) to each ballad, film, novel, play or TV show. There's the literary history of how the legend grew and changed over the centuries. And there's the highly dubious history of the various real people named Robin or Robert Hood who may, or may not, have inspired the legend. But there's also the personal history. By that, I mean the story of how each of us encountered the Robin Hood legend. It's the story of the emotional effect each version of the legend had on us -- whether it provoked joy, anger or indifference. For many, it's not an important story -- this "Personal Journey" as I once called it. There are many other stories or interests that move people. But Robin Hood is the legend that moved me. It's the reason this website exists. And there must be a number of others who have gone on "personal journeys" with Robin Hood; however different those journeys may be from my own. Stories do not last over 600 years solely as instruments of torture that English teachers inflict on their students. (Granted, I've known a few teachers who can make it seem otherwise.) And perhaps there's something in my personal experiences that can provide a clue as to why the legend survives. I'm a little too close to the tale to judge. In the subsections ahead, I explore my experiences with Robin Hood. First by recounting my experiences in childhood and beyond. 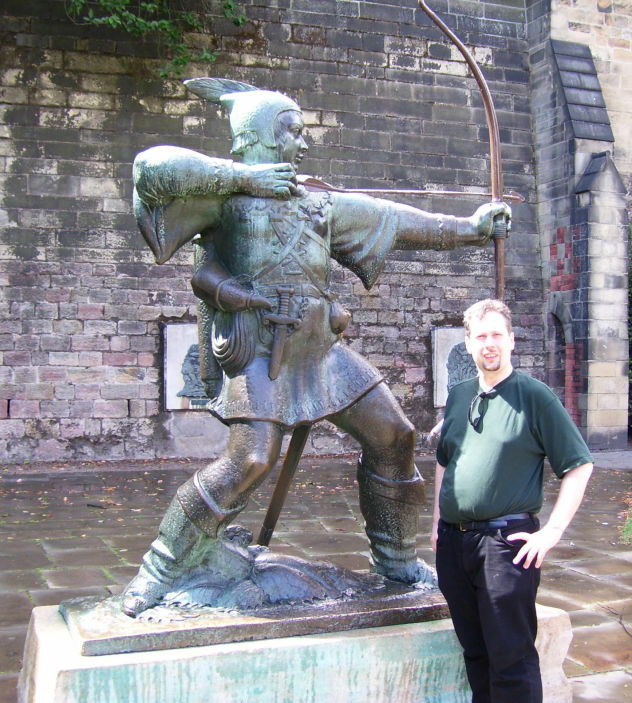 Then, over several sections, I describe my various vacations and trips to Robin Hood sites. Would-be tourists can follow my travels in Robin Hood Country and take a tour of Sherwood Forest, Nottingham, Barnsdale in Yorkshire and the other places of legend. Finally, I conclude with some thoughts on the basic appeal of Robin Hood. As an Amazon Associate I earn from qualifying purchases from the links associated with these books (at no additonal cost to you).